100% Print Performance -- Restored! Lots of perfectly good printers are thrown out and replaced when all they needed was a thorough cleaning. Save time, money and ink cartridges with Jetfix - an easy to use system to deep clean the nozzles on your inkjet printheads for great output. 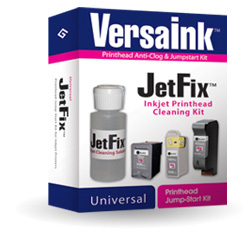 Scientifically created to work with the unique Magnetic Ink Character Recognition (MICR) properties of VersaInknano™ - JetFix™ easily and safely jumpstarts the printheads of all inkjet printer brands. Results are equally impressive when used to clean cartridges containing the upgraded magnetic-pigment ink featured in the VersaInk™ line or standard inks. Don't throw out your printer or new ink cartridge - for best operation and output keep your printheads clean. JetFix makes it easy to maintain and extend the life of your printer.